Wear what is comfortable. The is the most important thing. Even though I didn't have bump at all around 6 weeks, I found that a few of my elastic waist skirts hurt after a day of wear. Not worth it, even if you try to convince yourself you have to wear it because you won't be able to later (am I the only person that thinks like that?). Tuck in your shirt. This probably sounds a little counter-intuitive, but I swear this is the reason I was able to hide the bump for so long. I wore skirts that were a little loose to begin with (so they were comfortable around my waist) and tucked in a looser shirt. Even though my stomach was sticking out more than normal, it was tough to tell because of the two lines of fabric together and the loose shirt over the top. Layer over tight clothing. Early on, I really wanted to wear things that I knew I would not be able to wear later because of the slim fit (I'll miss you, clothes!). I was able to get away with wearing a few tighter items by layering jackets and vests over them. I could definitely tell that my stomach was sticking out a little, but with the layers it was tough to notice. Wear loose dresses. Not only are loose dresses comfortable (yay!) but they are great at hiding a bump without screaming "I'm hiding something." I felt like really loose shirts kind of made it seem obvious (unless I tucked them in), but a loose dress just implies that you like comfort. A shift shape is great, but if you wear anything with a cinched area (like the two outfits on the right) make sure they elastic hits below a traditional empire waist (right below your breasts). Empire waist dresses/tops make you look pregnant (even if you are not!). Scarves/big accessories are a great way to distract the eye from your belly. Pattern wearing patterns is a great way to keep the eye moving. 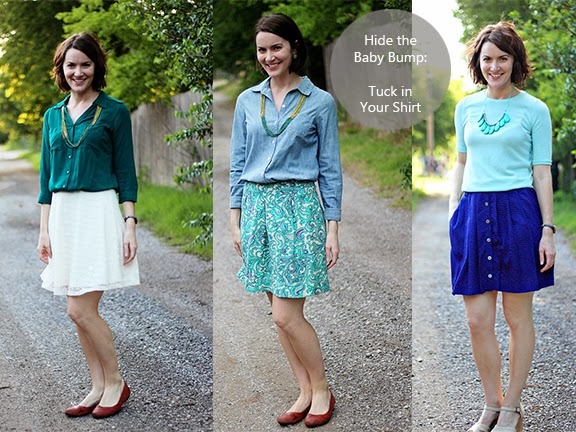 I have found that people notice my bump a lot more often when I am wearing solid colors. Wear all black. Black really is slimming. I wore a black top and black pants to work multiple times in early pregnancy because it was easy and really disguises the baby bump. Anyone else have some tips they would be willing to share? great tips! i shall keep them in mind for future :) i agree with empire waists making you look pregnant even when you are not, and i think i shall start stocking up on loose dresses! yay for being tall, i'm 5'9 lol. 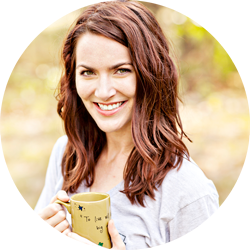 These are great tips - even for a non-pregnant person who carries her weight in the middle. Some of us have to be very careful to not look pregnant all the time! And I didn't know you were tall! I'm 5'9", so I feel an instant bond with other tall women! Great tips! This is one thing I worry about with the possibility of baby #3 sometime and the fact that I started blogging when I was very much pregnant with #2! I definitely agree that it is easier to hide when you are taller... I have never tried to hide my bump, but people are always telling me how small I am (which is funny, because I love a big baby belly!). But yeah, brava. You are a master of disguise. I would never have guessed from those pics that you were pregnant!! I actually did the math three times to make sure I was right about how long you kept quiet. Dang, girl. I'm impressed. 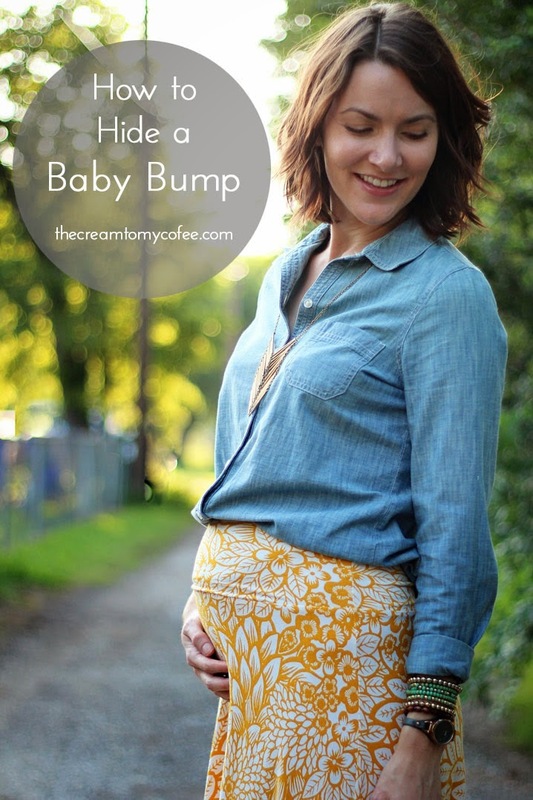 These are great tips, and it's crazy how well you hid the bump. Your bump-hiding skills are fantastic! I never would have guessed until you announced it. Love all your outfits!!! You definitely did a good job hiding it and staying stylish. :) Can't wait to see more bump posts!! Your 8 weeks outfit is SO PRETTY! 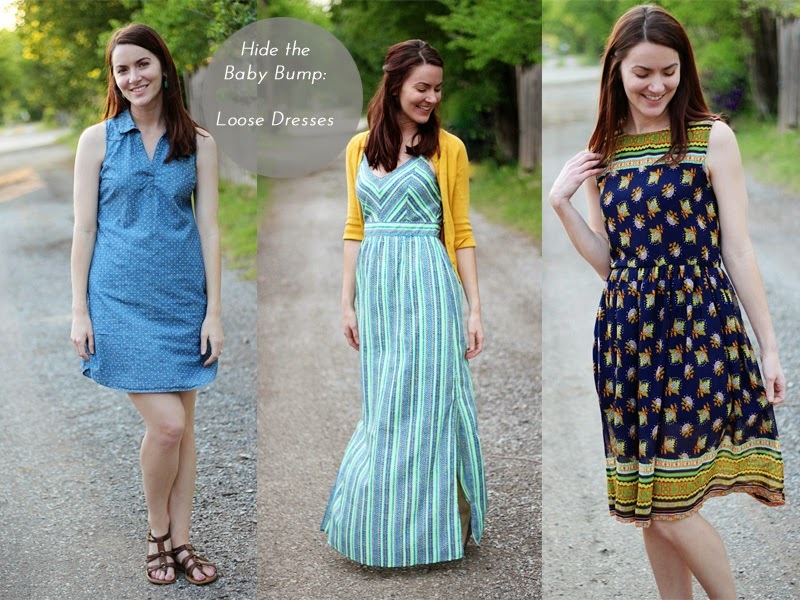 I think you are one stylish mom-to-be!! Great tips! It's amazing to look back and the photos now that I know you are pregnant. Where is that bump?! this post is great! You totally had me, I didn't know you were expecting until the photo in the yellow skirt!! So you can put a check next to all your tips because they work!... but I am glad you are showing the bump off I can't wait to see your new momma style! You did a great job of hiding your bump! I never would have thought of tucking in my shirt, but it definitely works on you. Also, the pattern tip is so true! Great tips! I am pinning this post so I can look back on it later. Not quite ready to hide a bump... but soon enough! Thanks for sharing such great tips! You look great in every picture! I would have never thought that tucking your shirt in would make it less noticable but it really worked!